Our clients can avail from us an exquisite range of Flight Chains, widely used in industrial and commercial sectors applications. This range is precisely designed making use of latest technologies by our efficient team of professionals. These products are manufactured under the surveillance of our quality controllers, in accordance with the industry set quality parameters. Furthermore, we provide this range in various specifications and dimensions with customization. Clients appreciate our offered range for their high tensile strength, dimensional accuracy and optimum performance. 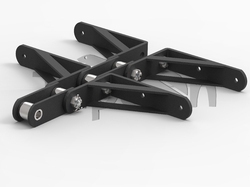 Flight Chains comes in various pitches and material combination depending upon its application and working environment. Flight Sizes are also available in vast range as per customers requirement. Bush, Roller and Pins are of standard as well as of custom sizes. We bring forth an impeccable array of Industrial Flight Chain for our clients. Offered range is accredited in various industries and sectors. Our offered chains are widely acclaimed for its availability in various customized specifications as per the requirement of our clients. Moreover, patrons can avail these in various sizes, grades and dimensions. Flight Chains are simple and robust in design and easily maintained. They provide low cost, efficient handling of equipment with many applications in manufacturing and processing factories. Chain & flight conveyors operate across a wide variety of markets, from grains, feeds and foods to oilseeds, biomass, waste and minerals. In general most free flowing and semi-free flowing powders, grains, flakes and pellets can be successfully handled with a chain and flight conveyor. Selection of the conveyor configuration and chain type depends on the material characteristics, throughput and application, although degradation and abrasiveness of the material and chain may also be important. 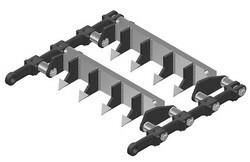 Forged Link Chains with Flights of Various sizes for scrapping and digging applications. 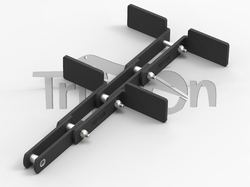 Tripcon Manufactures this chains in various sizes and metallurgical combinations as per the customers requirement. This comes in 142 mm Pitch in Light Duty and Heavy Duty Models. We hold expertise in offering a wide range of Chain With L Type Attachment. These Chains with L Type Attachment manufactured making use of best quality raw material, in compliance with the international quality standards. Our products finds wide applications in many conveying and storage systems which mainly deals with powdered, granular, flaked or palatalized material. Besides our products are also used to discharge hoppers and meter material at accurate rate in various industries. Looking for Flight Chains ?